GMV offers three types of villa: Lotus, Jasmine and Frangipani. Lotus is our standard room, with garden views. A Double Lotus Unit is perfect for people travelling with children, as effectively these are two interconnecting rooms. Jasmine has garden and mountain views, and is our stand-alone villa. Frangipani is our two-storey villa. 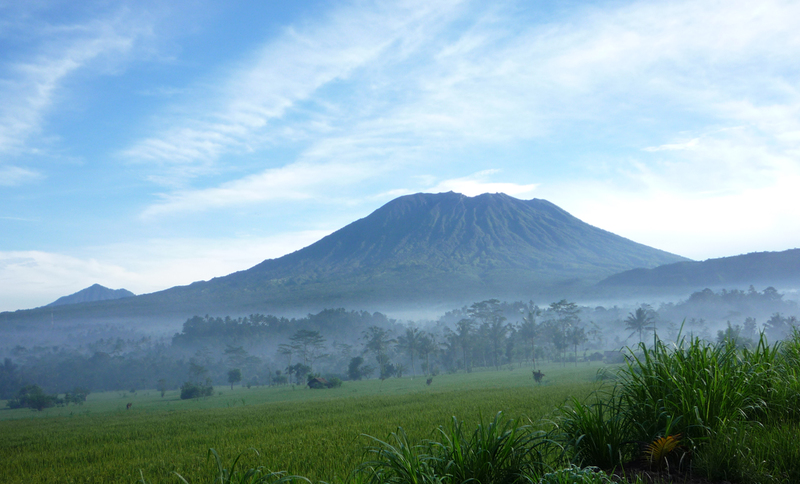 It has the best view of Mt Agung due to its location. Lotus costs IDR 726k/US$48 (low season) or IDR 847k/US$56 (high season) per night per separate unit. If booking for a family of 4 (2 adults and 2 children under 12 years of age), a double unit costs IDR 1,452,000/US$96 (low season) or IDR 1,694,000/US$112 (high season). Some of our units can sleep up to 3 children, please contact Clare for more information and a tailor-made quote. Jasmine costs IDR 847k/US$56 (low season) or IDR 968k/US$64 (high season) per night. 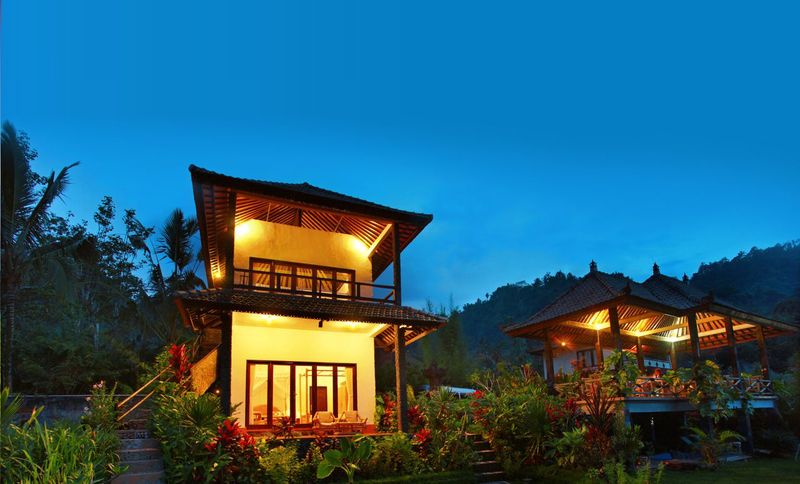 Frangipani costs IDR 968k/US$64 (low season) or IDR 1,089k/US$72 per night. Room prices include breakfast (Indonesian or continental) and 10% government tax (see also under tab ‘villas’). Prices will increase slightly to reflect some improvements made to the resort recently as well as the fact that from now on we will levy a 5% service charge on all rooms. Lotus will cost IDR 762k/US$51 (low season) or IDR 894k/US$59 (high season) per night per separate unit. If booking for a family of 4 (2 adults and 2 children under 12 years of age), a double unit will cost IDR 1,524k/US$101 (low season) or IDR 1,788k/US$118 (high season). Some of our units can sleep up to 3 children, please contact Clare for more information and a tailor-made quote. 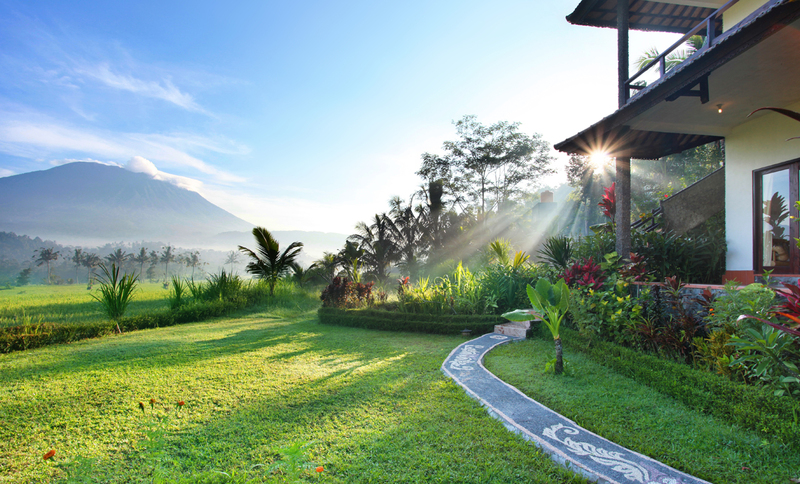 Jasmine will cost IDR 894k/US$59 (low season) or IDR 996k/US$66 (high season) per night. 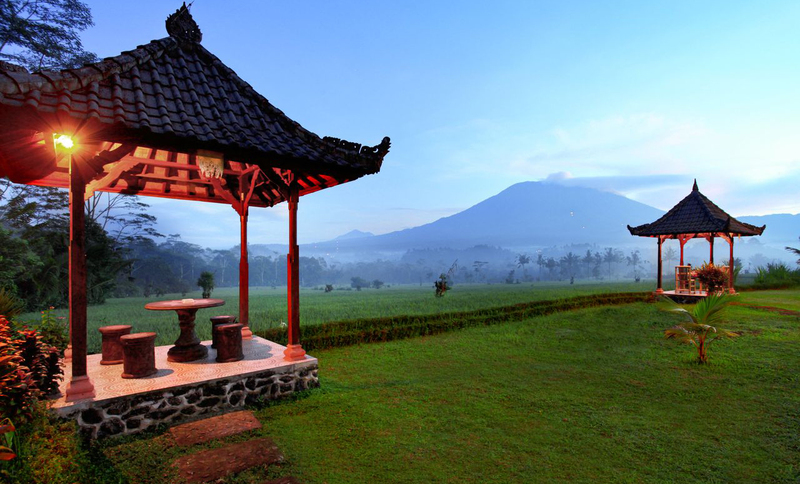 Frangipani will cost IDR 996k/US$66 (low season) or IDR 1,140k/US$76 per night. Room prices include breakfast (Indonesian or continental), 10% government tax and 5% service charge (see also under tab ‘villas’). The service charge will be divided fairly among our friendly and dedicated staff. We regard as ‘low season’ all bookings with a check-in and check-out date between and including 16 September and 14 June. We regard as ‘high season’ all bookings with a check-in and check-out date between and including 15 June and 15 September. Not sure as to which villa best suits your needs? Please contact Clare for more information or a tailor-made quote. For special offers and package deals, don’t forget to check out our package deals. Please fill in your preferred check-in and check-out date in the search boxes below. Alternatively, use the calendar icon and click on the desired dates. Once you have hit the button and made your reservation request, the system will take you to a new page. Please note that you will need to scroll down to the bottom of this page (to the ‘Reservation Summary’) in order to see your reservation, fill in your details, add any special requests you may have, and make your payment via PayPal. Your booking will only be final once full payment has been received. Please contact Clare if you wish to pay for your reservation with Bitcoin and we will guide you through the process. We use the CoinCorner gateway to process Bitcoin payments. For information on group bookings and wedding packages, please contact Clare . If you are a yoga or meditation teacher and would like to work together with us, please discuss with Clare what we can offer. By making your reservation via this website or directly at the resort, you accept our Payment, Cancellation and Refund Policy and our Terms and Conditions.